Yesterday, in the Guardian , Damien G. Walter asked readers to list their favourite sf. And they did. In a follow-up blog piece, Walter estimates that more than 500 books were mentioned. I scanned the Guardian comments–yes, all of them–and counted only 18 women’s names. Eighteen. Out of more than five hundred. The ratio of women to men is 1:24. About 4%. I’m quite aware of gender bias in literature (see, for example “Hard Takes Soft” and “Girl Cooties”) but this ratio, frankly, shocked me. In a subsequent Twitter conversation, Walter ventured that this ratio reflects a reader bias towards naming Classic SF, that he believes a similar US-centric poll would reflect the same boy-bias. I disagree. That is, I don’t think the bias would be as strong. I think the US is closer (though still not very close) to gender parity than the UK. But I’m guessing; I don’t have numbers. In the Twitter discussion, others (Cara Murphy, Kevin McVeigh, Karen Newton) suggested that women didn’t write much sf in the classic days. Also that the recent British Library sf show included few women. That in a BBC Culture piece about that show, no women at all were mentioned. Bias in action. Clearly, women’s sf is being suppressed in the UK. Oh, not intentionally. But that’s how bias works: it’s unconscious. And of course sometimes it’s beyond a reader’s power to change: you can’t buy a book that’s not on the shelf. You can’t shelve something the publisher hasn’t printed. You can’t publish something an agent doesn’t send you. You can’t represent something a writer doesn’t submit. Etc. And always, always name the behaviour around you: we can’t change behaviour until it’s named. Once this bias against women in sf was named in the Twitter conversation we were able to move on to the beginnings of what I hope will become a fruitful discussion of how to mitigate said bias. I want to continue that positive discussion here. To begin with, we need numbers: ratios of women/men being published as sf in UK, US, Canada, India, New Zealand, Australia, and other English-speaking territories. Ratios of historical publication of same. Reviews of same. Of book format. Of cover design. Of sales. Of awards. And so on. Anyone got any of that to hand? Anyone got a platform through which they can put out a call for same? I’ve read them all. Every. Single. One. (I was delighted to see Anna Kavan. Her Ice completely turned my head.) Some I like, some not so much. But none of the names are new to me. Which, I think, speaks volumes. Do you have a good sense of the gender of SF readers? This question is motivated by conversations with parents about the cartoons or animated films their young children watch. Several report that their boy children won't watch anything with a girl major character, while girls will watch boy major characters. Is this bias is reflected in later reading? And then in choices of 'best'? I'm not terribly shocked (if by shocked one means surprised) by the results–especially in the UK (Farah Mendlesohn has been posting for some time about the gender bias in sf in all areas). I would be surprised if the US were in any way close to gender parity (although it might depend on how one defines “sf” — that big hairy nasty question–for example, do all the paranormal romances which tend to be shelved in “romance” sections in bookstores but which feature fantastic characters–which some would relegate to fantasy not sf!). That is, are we talking SCIENCE fiction or SPECULATIVE fiction/fantastic literatures? Those definitions have been used against women as your post references for some time (and brilliantly fit Russ' brilliantly expressed observations). And to Ladyjanegray: there has never been any authoritative demographic study of science fiction readers and or fans by any definition of the word (there were sf magazine polls back in the day in the US, but those assumed the only 'readers' were the men who subscribed to the mags and ignored the women in the house–like me, reading my father's sf mags from the age of seven or so). Read Helen Merrick's THE SECRET FEMINIST CABAL and Justine Larbalestier's THE BATTLE OF THE SEXES for all the ways in which women readers and writers and editors and reviewers were ignored/suppressed by the men in sf. (Then you can check Eric Davin's work which traces all the women publishing in the pulp and classic era, often under male or gender neutral pseuds, and unfortunately trying to argue that proved sexism did not exist in sf). I'm not saying I'm not all for this effort–but it's not as if this problem or attempts to address it are new–they've been going on for decades! And I think change has occurred, so it's worth pursuing. My connections are more in the academic world of sff criticism, and on LJ/DW in the parts of fandom that are women and/or feminist dominated. This article and the stats are not specific to sff. It may or may not be useful to remember that the NYT has a separate section for reviewing sff (and other genre fiction), and also started a separate best sellers list when Rowling's work dominated it (children's best selling as compared to “adult” literature? ), there are genre biasses build into the reviewing system. He credits Sue Linville's 2002 article on gender bias in sf! It's for academia–but I wonder if some could be applied to this effort! ladyjanegray, pretty much what Robin said. Lots of women read sf; we just don't know how many. I wasn't shocked by the bias but by the size of it. 4%. Ooof. But right now I have someone asking me how he can use his platform to help improve the place of women in sf and I want to get as many numbers, recent numbers, as I can to support his (and others') efforts. I'm also looking for suggestions for those with a media platform or buying power as to how they can mitigate this bias. Hi Nicola–I sometimes tell people I got my Ph.D. so I could take over the world for sff, so am always happy to get involved in these projects. I did post another post–it had lots of links which might have been a problem – so if you could repost, that would be fantastic! And she is the sf person, so has data if you'd like it (this discussion is taking place on my locked down fan journal–I'm fairly out, but don't link my offline name and fan pseud in public if I can avoid it). *points up* that's me–forgot to sign my name. Excellent post which makes some very valid points. 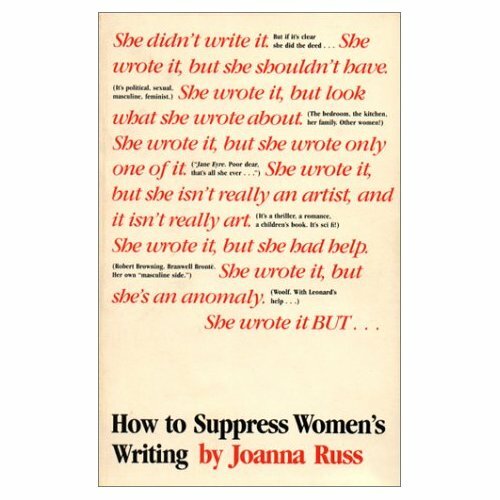 I really must read Joanna Russ's 'How to Suppress Women's Writing'though I suspect it might make me very angry. It is interesting that there is little research on how many women read SF – we seem to be invisible as readers as well as writers of SF. I suspect online purchasing has helped to increase the numbers (we can buy invisibly too!). I wonder how the numbers differ when Fantasy is included as there are significantly more women authors here. Does this indicate tha,t within the genre publishing world, writing fantasy is a more acceptable way for women to make their voice heard? Cara, I really do recommend How to Suppress Women's Writing. It's not like reading something like Backlash because Russ is witty. In some ways it's a delightful read. Re: fantasy. Oh, yep. Read Russ. Read my own “Hard Takes Soft”. The British Library show does include women, Lauren Beukes for one, but the BBC coverage ignored them. I don't know how good or bad the BL gender mix is, any criticism is of the BBC. Kev, I'll go look at your list. Maybe there'll be someone new to me! BTW, I didn't say the BL didn't include women. I didn't say Walter was propagating that myth. Just to be clear. Good to see Zenna Henderson there – a lot of lists I see miss her out. Since the Guardian article claimed that SF could include any kind of spec fic I need to ask…No Vonda MacIntyre?? No Jessica Amanda Salmondson?? No C L Moore?? No Octavia Butler?? No Suzy McKee Charnas. No Marion Zimmer Brady?? No Elizabeth Moon?? No Elizabeth A Lynn?? No Andre Norton?? No Mercedes Lackey?? That's just a few of the authors spotted in a quick glance at my shelves. Not to mention Kate Wilhelm, Kit Reed, Chelsea Quinn Yarbro, Joan D Vinge, Carol Emshwiller, etc. What *do* these people read?? Ze, I hear you. Take a look at Kev's list, see if you can add to the 150 women f/sf writers there. Ian Sales started a discussion of possible SF “Mistressworks” a few months back that got a lot of feedback: http://iansales.com/2011/03/17/the-sf-mistressworks-meme/. Erudite Ogre, thanks John, for linking to Ian's work. I borrowed from him with his permission as the basis of my list. Tori, hey, the Forbidden Planet list is at least 8%, woo hoo [irony alert]. I just listened to the BBC thing. Gwyneth is so right. Her career would have been utterly different if she'd been, say, Gareth. Editors can do much, but as usual it's a question of who the editor happens to be and what her or his priorities are. Very early in my dubious career, around 1975 when I was 25, when I had held exactly one editorial position, I was asked by a man who had recently acquired a medium-sized publishing house to contract and edit his list. I agreed, jubilant, but then he sent me a proof to check of the only book he himself had bought so far, Marabel Morgan's “The Total Woman”, and my heart stuck in my toes. So I spent a week wrestling with my conscience and went back to the publisher and told him that he would have to choose between publishing that book and employing me. That time I was lucky; a day or two after, I received in the mail the print original for the book. It was never published in Sweden, and I worked around five years for him, publishing instead the first Swedish editions of several books by Ursula Le Guin, Shirley Jackson, Kate Wilhelm, Mary Renault – and, certainly, a few men as well, including as far as I know the first serious novel about a lesbian protagonist written by a major Swedish male author. But the problem, and presumably point, is that you do sometimes have to take risks, where losing can cost you something. I'm proud that I took the risk that time. But would I have done the same fifteen years later, with small children depending on me and considerably fewer options still open than at 25? I hope so. But it would have kept me awake more nights, at least. When it comes to sf, it seems to me that very little has changed in the last 40 years. For a short time during the mid and late 1970s, feminism and gender discussion was what was happening in sf. Then came the (almost all male) cyberpunks, nostalgically revisiting the 1960s revolt but winning this time, and all that was forgotten; I've actually seen (though I can't quote the at this moment) overviews of sf claiming that the 1970s was a “lost” decade when sf had no direction and nothing new of interest was happening. I wonder how many awards the wonderful Connie Willis needs to win before she starts being listed. And this, I believe, is a large part of the problem. Virginia Woolf once made the mistake when replying to a writer who stated as a fact that no women could ever create literary art of the highest order, since only men could do that, of talking about Sappho. The given reply, of course, is that yes, okay, well, then almost 3,000 years ago perhaps there actually was one woman of literay genius, but since there have been no further ones, she was obviously a fluke. In the list Nicola gives above, what is really interesting, I thought, is that it includes the occasional writers of sf known to all (Woolf, Lessing, Atwood, Piercy) and the perhaps finest women sf writers ever to have worked in the field (Russ, Le Guin, “Tiptree”, our Sapphos), but virtually none of the excellent other women sf writers who get great reviews and win awards but who are then “forgotten” about, seldom mentioned in the overviews, the discussions of trends and development in the field, the endless debates on who is our current Heinlein, or Ballard, or Bradbury. Connie Willis, of course, but also Suzy Charnas, Marion Zimmer Bradley, Octavia Butler, Kate Wilhelm, Pat Cadigan, Elizabeth Lynn, Maureen McHugh, Justina Robson, Tricia Sullivan, Catherine Asaro, Elizabeth Hand, Katherine Kerr, Tanith Lee, Vonda McIntyre, Pat Murphy, Kage Baker, Sarah Zettel, Sheri Tepper, Liz Williams, Kit Reed, Carol Emshwiller, Kathleen Ann Goonan, Julie Czerneda, Carolyn Ives Gilman, Melissa Scott, Nancy Kress, Linda Nagata and so many others – present blogger and her partner included. These are the names absent in most of the discussions about sf over the last decades, which are always dominated by names of male authors who are – also – often quite good, but who become more “important” by being assumed to be those who define the themes and directions of the field. Georgiana, Willis probably wasn't listed because UK readers respond differently to her work than US readers (sweeping generalisation, yes, but it has to do with her settings–she often gets things wrong that, for example, Londoners might find ridiculous to the degree that it ruins the reading experience). Erudite Ogre, thanks for linking to my sf mistressworks meme. I also produced one of Women's Press titles here and a 21st century sf mistressworks meme list here. ian, those are great lists. I've read every single one of the WP titles–makes me feel like Super Reader :) I remember the conversation they sparked, which is of course a Good Thing. I just realised that, although I don't read much SF these days, almost all the SF on my bookshelves is by women – Le Guin, Asaro, Arnason, Scott. For me they are the keepers, not the male-dominated “classics” like Asimov. It's interesting that this doesn't seem to reflect the shift in gender dynamic amongst fans. Note the recent reaction against the ill-considered review that declared no woman would be interested in Game of Thrones (OK, that's fantasy, but it's a shared history and spectrum). Not to mention the highly successful Genre for Japan fundraising drive that was spearheaded by four women and drew attention across the genres of SF, F, and Horror. I was really proud to be a part of that, but completely surprised when it was pointed out to me that my involvement in such a project (along with three other women) was considered note-worthy and unusual. For what it's worth, here's me standing up to highlight Megan Lingholm's Alien Earth as one of the most incredible over-looked SF classics. Interesting that her better known alter-ego 'Robin Hobb' was deliberately chosen to obfuscate her gender under an androgynous name. Ro, I think the web has broken (is continuing to break) barriers. I like to think that in twenty years this kind of conversation will be head-scratchingly irrelevant. But I worry whose books might be lost meanwhile. Anon, have you added those names to Kev or Ian's lists? I wonder how much of this poll is skewed by the past. Science Fiction literature is Male dominated today, certainly, but it was much worse 25 years ago. Many of the male writers mentioned in the Guardian comments are classic Sci Fi writers – the Asimovs, Bradburys, Pohls and Herberts. Many of the Women who made the list are, similarly, older. I think most people would name their favourite book as one that they read when they much younger (rose tinted glasses and all) and perhaps the one that pulled them into the genre. If that is true, could this poll not be a fairer reflection of the genre a generation ago than it is today. It would be useful if the Guardian ran another poll asking for the last Sci Fi book their readers read. That might give a fairer reflection of the market today. The simplest way to suppress women's writing is to squelch any enthusiasm for reading it. Unfortunately, one of the easiest ways to squelch someone's enthusiasm for doing something is to tell them they have a moral obligation to do so and are a lousy person if they don't particularly feel like it. Another very easy way is to use the opportunity, when someone *does* reluctantly consent to try, to complain about what horrible people they are thoughout the process. If guilt gets you one reader, resentment will lose you a dozen in return. The simplest way to boost enthusiasm for women's writing is to (a) sell us on how good it is as writing (that's the easy part, because much of the best writing I know comes from women), and (b) — this is the difficult part — learn your desired audience's tastes, and write TO those tastes rather than trying to guilt them into changing them. You can win an audience over, or you can feel self-righteous for publicly denouncing them. You can't do both. Make your choice, ladies. What's so shocking? Men created Science Fiction and have been it's main contributors for over a hundred years. Even now the best science fiction writers are men. Women are a tiny tiny minority in science fiction. Get over your gender bias. JCH, such a poll would be interesting, I agree. Anon@ 9:10am: O rly? Mary Shelley says Hi. Perhaps you should have a read up about women's contribution to science fiction. There are plenty of excellent essays and textbooks out there. If you bother to look. I've probably been reading SF/F since before most of you were born (I'm just shy of 67). My first was a story in a kids' magazine (not a comic) in 1950. Comics came later, but I always preferred books. If my aging brain is working I counted 156 names (add a margin of error of no more than 10). To my own shock, there are only 13 authors on that list whom I have NOT read. What effing difference does gender make in the quality of writing? Oh, I'm a straight (if involuntarily celibate) male. And, finally, my favorite writer, irrespective of genre, is Ursula K. LeGuin. In spite of the above, I can't say I'm surprised at the Guardian results. I hear you on all points. I was surprised at my own shock. But I was, in fact, shocked. Very late to the discussion (sorry), I've been travelling. The BL exhibition is very good. The initial press release was devoid of women, but when this was [ahem] pointed out to them, they corrected it within twenty minutes in time for a later presentation. The book by Mike Ashley is hopeless. 4% of women on that blogroll matches the 5% of BSFA novel awards which have gone to women. A quick and dirty calculation minutes before I went on to Woman's Hour revealed the BSFA is abolutely the worst of the awards for rewarding women. This may be connected to the dreadful record of the UK sf imprints as that award is confined to books published in the UK, but the Clarke Award is one of the best at 44% awarded to women. In my survey of sf readers–self selecting–45% of the respondents were female. Farah, welcome–and I suspect this discussion will go on for a long time. It's a marathon, not a sprint. It's all about how long we stay, not when we got here :) Plus, you do so much in this regard. I wonder how long the BL exhibition will be up. I'm hoping to be in the UK briefly in autumn. I imagine it'll be gone by then. Sigh. BSFA for women = 5%? That's horrible. I wonder how many voting members are women? Robin Anne Reid (still not verifying my LJ ID). I've hesitated about making this post because it seems self-serving, but deciding that's due to the “omgwimminzcannotselfpromote), I'm going ahead. I edited the first encyclopedia dedicated to Women in SF and Fantasy (Greenwood 2008). Yes, it's horribly expensive (but that is true of all reference works and encyclopedias). Here are lists of the content that I worked out (remember, this was published in 2008, so I began working on it in um 2004, late, I think, which means in some respects it was out of date by the time it was published–true of all print reference works). (Also, Greenwood policy required some men be included who were known for women characters….). Robin, I want that encyclopedia! Thank you, again, for all the work you do. And, by the way, no I don't see this as self-serving, more a public service. And, even if it was, what's wrong with that? If we wait for others to serve us, we'll get nothing. Exactly! But I'm just old enough (mid-fifties) and raised in a nice conservative rural environment to have spasms of self consciousness about it–luckily they're much shorter and less intense than they used to be–and while I know the work is beyond a lot of people's individual book buying budget, there's always libraries! And the contributors are a fantastic list of major names in feminist sf in both the writing, editorial, fan, and academic field. I was JUST posting about something very similar earlier this week, but my point/problem was the lack of celebrated women writing/drawing comics and graphic novels, or celebrated comics featuring women (real women, that is. I love Catwoman and Harley Quinn, to go with “traditional” American comics, but these are hardly examples of truly round, diverse characters). If you look down a list of, for example, the “top talent in comic books” that the Comic Book Legal Defense Fund have employed for their Liberty Trading Card set, out of 39 “talents”, only 2 are women! Does that mean that only 5% of talented artists and writers in the industry are women? Of course not. That's just one example, there are hundreds, if not thousands. If you read an interview with a male artist, his list of inspirational favorites will almost always be exclusively male, while a female artist will usually have a mix between male and female. Why? Because frequently comics drawn by women, or about women, are almost always stuck under less legitimate genre classifications. They'll end up mixed in with the manga (despite not following any of the guidelines that qualify something as manga, or even OEL) ,or placed in the kids/YA section among books rather than other comics, or somewhere other than the actual graphic novels and comics section. Or they're simply not carried at all, or not even given the chance to publish, or the writers/artists will censor themselves, or the girls that want to be artists will see a list full of male names and not even bother, ect. Sorry, not trying to rant off topic, I just mean that the situation is pretty much identical in most storytelling mediums when it comes to women and being recognized or given their due. Part of me has been desperately wishing I had the funds and know-how to start a womens-only original content SF/Fantasy writing and comics online magazine. There isn't anything that really fits the bill, and there seems to be a need for one. Remki, yes. Divide and conquer, even when not a conscious tactic, is definitely something that works. Women need to claim their space, plant their flag etc. etc. Okay maybe someone has mentioned this before, maybe not. Have many people been inside brick & mortar bookstores of late? Look in the science fiction & fantasy section at all? At least here in the states the shelves are packed with a seemingly endless supply of vampire/zombie/wish fulfilment fantasy written by women (or seem to be). It serms to me new science fiction, written by women or men is given a short amount of time then kicked to the curb to make room for more books with covers of muscular women in torn clothes hefting crossbows. I'm male, last time I checked, 43 yrs old. Of the women out of the 500 authors I've read 7 of them. C.J. Cherryh is one of my favorite authors in any genre. Some of the ones I've read I like, others not so much. What surprises me are some who made the list (Julian May for example, who I really like, but surprised she's on the list) to those who aren't on the list, Pat Cadigan a glaring omission as another example. I personally think this the wrong argument to be having. Instead of dry washing our hands repeatedly over male authors and female authors in science fiction and how many of one gender represent a certain % of novels on a favorites/best list we should instead work on clearing bookshelf space of utter crap and make room for science fiction of quality. Doesn't have to be science fiction. Lots of crap out there on the bookshelves. But none of that matters because what sells sells. Hogs eating at the trough will eat slop or steak. I don't care if you are male, female, or a transgender dwarf working in a massage parlor. If you can put several words together in a coherent manner and tell a damn good story that's what I care about. This old numbers and % game is quite frankly tiring. Write a great novel and find a way to get it to me. I'll read it. Or I can just stare at covers of Belinda the zombie/vampire/werewolf Slayer in Barnes & Noble and weep wondering where all the science fiction has gone. Hey, Ripper, I have written several great novels for you to choose from. See sidebar at right. Not a zombie, vampire, or werewolf among them. This is a little misleading. The same authors were repeated over and over again in the list (most of whom I'd read), as well as the same books. Reading the intro paragraph here, it sounds like there're 500 authors listed, of which only 20 women, that is not so. I am, by the way, a woman who loves sci-fi and dabbles at writing it, and I've found that my gender is far less prone to liking this gender than males. May explain why more men write sci-fi too. Being a geek (and possibly because I am male :) I compiled a list of all the Novel winners of the Nebula, Hugo, British Science Fiction, World Fantasy and Arthur C Clarke awards for our SF book club. The gender results are that females account for 25% of the winners and 24% of the awards, giving them a ratio of 1.73 awards per author, as opposed to 1.84 for the male authors. This means that while the numbers are unequal, there is parity in the recognition of the authors. A fuller research would need to look at the gender ratios in the nominees and against the publication percentages. As a related note, our book club covers both SF and fantasy, and the core membership is balanced (3:4 female:male). Of the books chosen by the whole group to read, there has been only 15% by female authors, while those chosen by the female members was 17% female. This suggests that the gender bias in this small group is equal across both camps. Note that two thirds of the female-authored books chosen were fantasy rather than SF. When it comes to fantasy novels there is no gender bias in our back-catalogue. Anon, there are probably a score of different explanations, and half a dozen (at least) ways to interpret the numbers. I'm guessing I've thought of or heard most of them over the last 30 yrs. But I was still sufficiently shocked by these numbers to blog about it. PeterD, many thanks for that info. Numbers are good. ian, I saw that. I sincerely hope someone does do some counting. I hope everyone who reads this goes and votes.